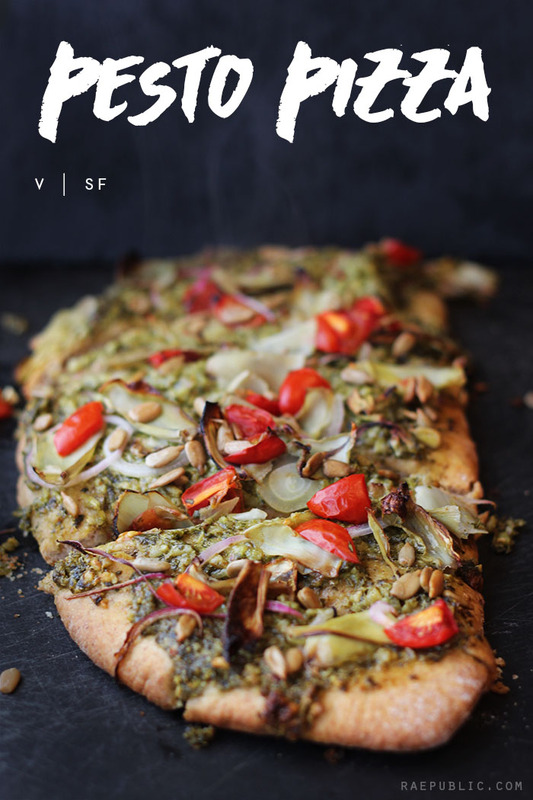 Easy, vegan pesto pizza that is so delicious you won’t even miss the cheese, or the meat for that matter! This plant-based pizza is both filling and light, allowing you to enjoy it as a meal all on its own or as an appetizer. The artichoke hearts that adorn this pizza are a great source of fiber, vitamin C and magnesium. Line a cookie sheet with a silicone baking mat OR spray pan with olive oil. Roll out vegan pizza dough on cookie sheet. Spread pesto over pizza dough. Place onions, tomatoes, artichokes and pine nuts on dough. Don't have any basil on hand to make the vegan pesto? Try this plant-based Red Pizza Sauce instead. Make sure to follow me on your favorite social media platforms and comment below if you're lovin' this vegan pizza recipe!